2. The promotion will run from 11:00 on Wednesday 27th July 2016 until 23:59 on Sunday 31st July 2016. 3. Visit the spoiltpig Facebook or Instagram pages and count the number of sheep hidden in the promotional post. Entrants are required to ‘like’ the post and comment on the post with their answer including a mandatory #spoiltpig within their comment. 5. Either 1 x spoiltpig trolley key, 1 x spoiltpig tote bag, or 1 x spoiltpig fridge magnet and 2 x spoiltpig money off next purchase voucher. 10 prizes available. 6. Within 1 working day of the promotional close date, 10 winners will be selected at random. 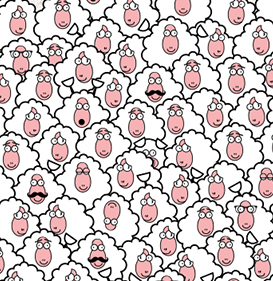 Winners will have to have complied with all promotional requirements and guess the correct number of hidden sheep in the picture. In the event of no one correctly guessing, those entrants who have guessed the closest (by 1 either way) will be entered into the draw. 9.All entries must be made by the participant themselves. Bulk entries made from trade, consumer groups or third parties will not be accepted. Incomplete or illegible entries and entries which do not satisfy the requirements of these Terms and Conditions in full will be disqualified and will not be counted. If it becomes apparent that an entrant is using a computer(s) to circumvent this condition by, for example, the use of ‘script’, ‘brute force’, masking their identity by manipulating IP addresses, using identities other than their own or any other automated means in order to increase that participant’s entries into the draw in a way that is not consistent with the spirit of the promotion, that participant’s entries will be disqualified and any prize award will be void. 12. Winners’ full names and counties will be available by emailing [email protected] to spoiltpig, Denhay Farms Ltd, Devonshire Road, Heathpark, Honiton, Devon EX14 1SD for a period of one month following the closing date. 13.This promotion is in no way sponsored, endorsed or administered by, or associated with Facebook, Instagram, Twitter or Pinterest. You understand that you are providing information to the Promoter and not to Facebook, Instagram, Twitter or Pinterest. The information you provide will only be used for fulfilment of this promotion unless you have agreed to its use for any other purpose. By entering the promotion all participants agree to a complete liability release for Facebook, Instagram, Twitter and Pinterest.